Can you think of a great name for the new Bell Tents camp at Bonaly? Involve your young people in our competition and win a free weekend for your Beaver or Cub section! Neil is going to chair the panel which decides the winning name. We would like to have a name with instant appeal to young people. So how about something such as Battlefield Camp, or Stargazer Camp, or Aztec Camp, or Touareg Tents? You tell us what your young people think! 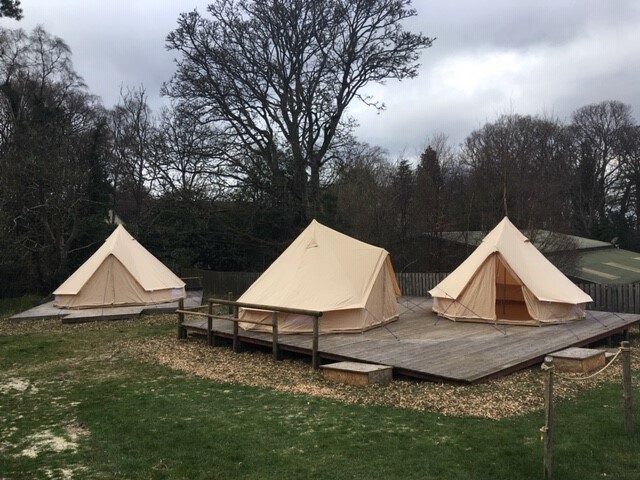 Our tepees have reached the end of the working life and we have replaced them with three Bell Tents. They are available for those camps where you want the outdoor experience without the hassle of pitching tents. These are particularly attractive for Beaver (or any) one night sleep overs. The three Bell Tents are permanently erected on decking platforms. There are 2 Bell Tents which sleep 6 persons in each and 1 Bell Tent which sleeps 10 persons. Camping mats are supplied. There is a site hut for cooking or storing equipment, and a small campfire area with seating. There is also an area for erecting more tents. More information at https://sesscouts.org.uk/camping/ or at the Bonaly office: 0131 441 1878. Closing dates for entries is Sunday 5 May 2019. Don’t delay – get thinking now!